Your vehicle’s braking system is the most important safety component within your vehicle. For expert brake service bring your vehicle to SAF-T Auto Center in Wallingford, CT. Being safe on the road is important and drivers must know their brakes are working. If routine maintenance and repair are ignored it can lead to unexpected breakdowns and costly repairs. We suggest having your brakes inspected every other oil change. Don’t know when your last brake service was, that’s ok call (203) 294-1555 or stop by our 121 N Plains Industrial Road location and one of our brake repair Specialists will be happy to help you. Additionally, with every brake service, you will receive a courtesy safety inspection and all brake repairs are backed by a 36-month / 36,000-mile warranty (brake pads and brake shoes have a lifetime gaurantee on the fristion material). Your braking systems will give warnings to alert you to the need of brake service or repair. These alerts can be both audible and felt the vibration of the steering wheel and/or pedal. The most common warning signal is a high-pitched squeal when the brake pads have worn down too low. This can often be missed if your radio or air conditioner is on. So, make a point to listen to your vehicle a few times a month while the air and radio are off. If you’re driving and you hear a squeal whenever you apply your brakes, then it’s time to replace your brake pads. The squealing noise may not be an emergency, but it certainly should not be ignored. Another warning signal is if you hear or feel grinding when braking. This is a sign your brake pads have worn away completely. 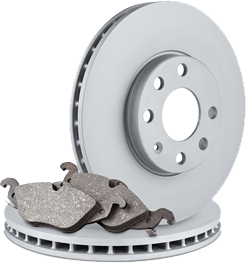 The grinding you feel or hear is the metal from your brake discs grinding against the caliper. Unfortunately, if this happens you may not only need new brake pads but also new rotors as well. Another thing to watch out for is a spongy feeling when braking or if it takes an effort to depress your pedal and stopping distance is increased. This can often be caused by a leak, air in the line, damaged line, or low brake fluid. These are only a few warning signals to look out for. Yet, if you do experience any of these problems please have your car inspected immediately for your safety and others. Schedule Your Brake Service Today! Our team of dedicated technicians is here to help you with all your brake service and auto repair needs. Let us help keep you and your vehicle safe and performing well while driving around Wallingford. Call (203) 294-1555 or schedule your next service appointment online today. For your convenience, we offer free local shuttle service upon request and Fresh Hot coffee while you wait.